I still haven’t made up my mind about the border for the Three Dudes quilt (which (prompted by Mum asking why it was called Three Dudes, and me realising that the answer was that it was based loosely on a quilt design that was based loosely on a quilt design that was originally called Three Dudes, so by now it is very far removed from the original concept!) I have decided to rename as the Cordon Fence quilt (because the criss-crossing of the dark strips reminds me of chain-link fencing, and because Christchurch)), I’ve set it aside to think about another day. Which meant my sewing machine was sitting empty. Which is a bad thing! 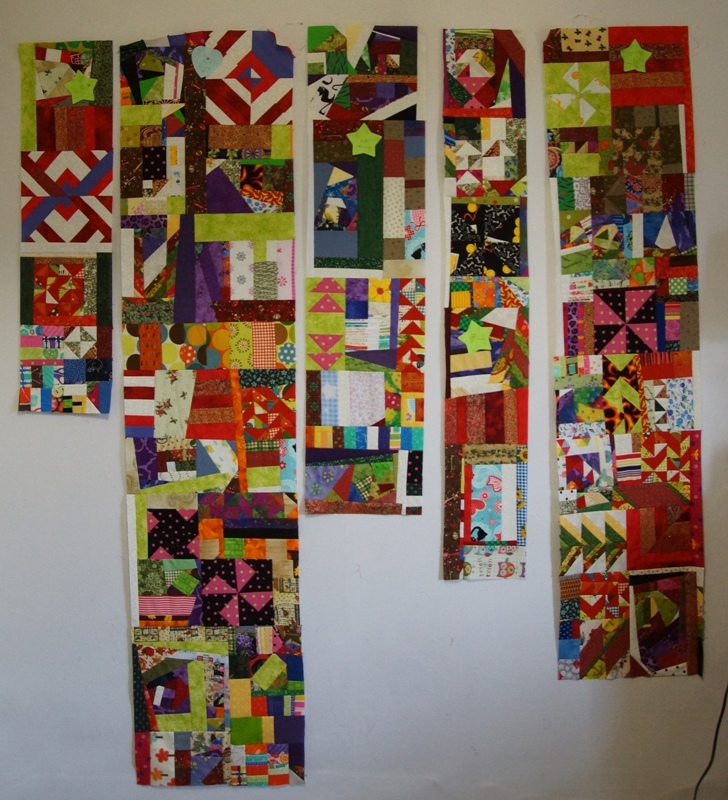 The longest strip is long enough to go the full width of a quilt, and the others are getting close. I’ll need twice as many strips to make up a full quilt top, but even so, that’s about a third of a quilt made so far, all from scraps I would otherwise have thrown away (plus a few sample blocks where I was testing out how an idea would work). Hmm, I suppose the real message I should take from this is that patchwork is an incredibly wasteful process! I also started a brand-new project (because having four unfinished quilts in the production line is never enough ), inspired by a charm pack (i.e. 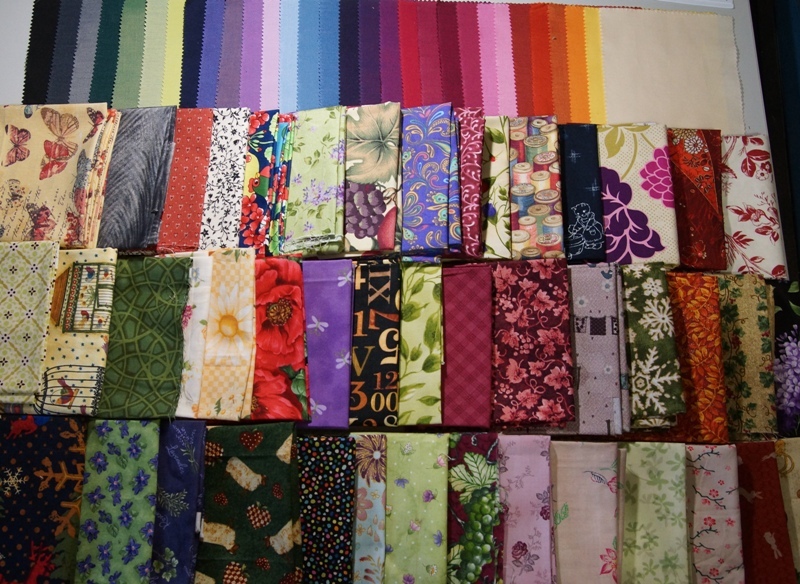 a pre-cut set of 5 inch squares) of Oakshott fabrics I’ve had sitting in my stash since forever. I won them during TartanKiwi’s In Flight quiltalong, and put them aside because the fabrics, though just small pieces, were so nice that they deserved to be used in a project that highlighted them somehow. A very busy collection, but that’s the idea – the plan is they’ll provide a contrast to the plain squares, while keeping all the colours in roughly the same tonal range. In other news, work has been a bit stressful lately. On the plus side, I’m involved in a really exciting (and challenging! It’s definitely going to be stretching my coding skills!) project to produce a digital edition of a medieval manuscript. I’ve been sort of project managing/overseeing the project for a while, but not all that heavily involved in the actual work, but since Lucy-Jane left the lab, I’ve had to pick up a lot of the coding work she was doing, which is involving quite a steep learning curve (especially as it uses a language I’m not familiar with (both in the computer language sense, and in the human language sense, because the manuscript is in Latin! Although thankfully I don’t need to worry about that side of things – we have historians doing all the clever need-to-be-able-to-read Latin stuff, I just have to help make their work appear on the computer screen in the right way. Although I suspect I will have picked up quite a bit of Latin before we’re finished!)). So that’s something fun and juicy to get my teeth into. On the minus side, a couple of days after Lucy-Jane left, Rosalee also put in her resignation. Not that I blame either of them for leaving – they’re both going to exciting new opportunities that they would have been mad to turn down (Lucy-Jane to a private sector programming job, Rosalee to work in social justice activism), but it’s suddenly dropped the Lab from three staff (plus the boss, who is teaching pretty much full time, so we don’t see much of him) down to one, and there’s no way I can pick up all of the work myself. Which puts the Lab in a bit of danger as to its long-term viability. Luckily the university has approved us taking on a couple of extra staff for the rest of the year (at the end of which my contract runs out anyway, so we’ll be having to make a business case to continue the Lab anyway), but it’s going to be tough getting them up to speed quickly enough that it doesn’t damage any of the projects we’ve got on the go. The Word literary festival, by piggybacking on the Auckland festival, have been having an autumn season, basically bringing a few of the authors who were going to Auckland anyway down to Christchurch. I’ve only managed to get to one of the events (they all sold out very fast!) – a reading/performance by Ivan Coyote (whose book was one of the ones I bought at Scorpios the other day). It was a great night – their work manages to be incredibly entertaining while touching on some pretty deep issues. I thought about staying for their book signing afterwards, but chickened out – I never know what to say to authors at signings, and end up just mumbling a vague “Hi, I think you’re great, please sign this” and rushing away, and then think of all the cool and articulate stuff I wish I’d said afterwards. And anyway, the queue was incredibly long, so I was worried if I stayed I’d miss my bus. This entry was posted in Entry and tagged Cordon Fence Quilt, craft, gender, Little Squares Quilt, patchwork, Scrap Basket Quilt, talks, Three Dudes Quilt, Word Festival, Work by FutureCat. Bookmark the permalink.